Turkish security forces have killed 21 members of the Kurdish paramilitary group, the PKK, in south-eastern Turkey, officials in the area say. Three members of the Turkish armed forces also died in the three-day operation in Siirt province, they said. It is reported to be the biggest clash in the area since the PKK declared a unilateral truce in 1999. 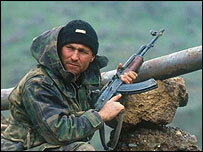 Turkey's war with the separatist PKK guerrillas in the 1980s and 1990s left more than 30,000 people dead. The PKK took up arms against the Turkish state in 1984, in a campaign to create a Kurdish homeland in the south-east. Reports say the fighting broke out about 40km (25 miles) from the Iraq border near the town of Pervari, when a group of PKK rebels responded with gunfire after being ordered to surrender by Turkish security forces. Turkish officials said guns, hand grenades, mines, rounds of ammunition and explosives were seized in rebel hideouts in the area. The rebels called off their truce last June, saying Turkey had not reciprocated. PKK leader Abdullah Ocalan was jailed by Turkey in 1999. The Sirnak governor's office in southeastern Turkey said the latest security operation began on 12 April.